The Literature Production Centre team at Yirrkala School North East Arnhem Land was awarded the 2017 Australian Education Union (AEU) Arthur Hamilton Award for Outstanding Contribution to Aboriginal and Torres Strait Islander Education at a ceremony in Melbourne. 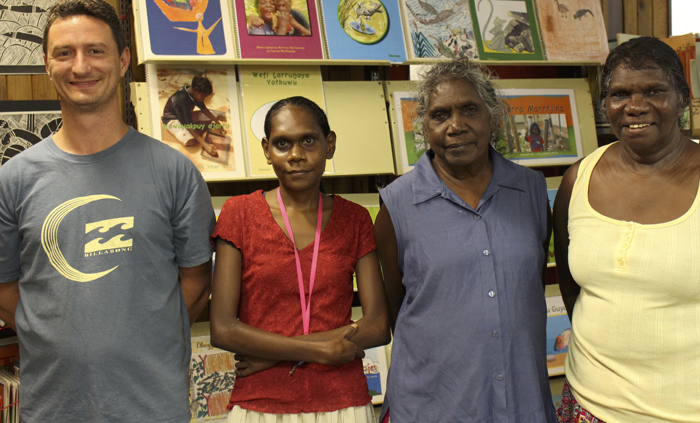 The award recognises the outstanding contribution Yalmay Yunupingu, Rärriwuy Marika, Bamurungu Munungurr and Jake Stockley have made to the school’s bilingual education program for Yolŋu students. Yalmay Yunupingu, Yirrkala School Teacher Linguist said recognition for the award must be given to all the people, Yolŋu and Balanda or non-Indigenous, that have contributed to 40 years of successful bilingual education at Yirrkala School. “Literature Production Centre dhaŋum ŋayi ŋaraka. Ŋalmaliŋguru djorra'wu, dhäwuwu, romgu ga dhärukku. Djalkiri dhaŋum yaka ŋayathan,” she said. Literature Production Supervisor Jake Stockley said the centre co-ordinates the Yolŋu Indigenous Languages and Culture program including, Yolŋu Matha, Galtha Rom and Garma Maths and supports Yolŋu teachers to deliver the school’s bilingual program. “Dhuwaya Yolŋu Matha is the language the children speak and it’s the language they think in so without these resources the children would be at a severe disadvantage when learning anything new,’’ he said. “We select and produce the resources in Dhuwaya Yolŋu Matha for the teachers to use - the books, songs, videos, activity sheets, dictionaries, certificates, flash cards, alphabet charts, translations, posters and pretty much everything you can imagine a teacher might need to teach a child reading, writing, mathematics, history, science or any other curriculum area. “We do that with the help of other Yolŋu and Balanda and the teachers who speak Yolŋu Matha will come into the centre to make their own teaching resources as well. A new Indigenous Languages and Cultures curriculum has been published and is currently being trialled in several Northern Territory schools to help give all Territorians the opportunity to benefit from keeping Indigenous languages and cultures strong.